I thought it was the start of a love story. This book really reached out to me. It's the type of book that everyone can relate to in one way or another. For me, I was very much Caddy and I had a friend like Suzanne. I imagine a few people have had a friend like her. You know, the one your family and friends see as toxic, yet you see past the volatile exterior, to see the vulnerable person underneath. Sometimes if you're lucky, the friendships lasts and becomes less toxic, but the majority of the time, it dies. It takes too much energy and strength to keep it alive. I love that boys don't feature strongly in this book. The friendships that we make are often stronger than the relationships we have. And when they end, the pain can be so much more unbearable. This book is utterly beautiful, yet heartbreaking at the same time. In front of your eyes, you witness Caddy making the journey from a young girl to a woman. Her perceptions and opinions change after the experiences she go through. This book not only deals with friendship but also the effects of physical abuse. The bruises may fade, the cuts may heal but the memories often lie just below the surface. Without help, it can often be so hard to move on. Suzanne struggled to let the past go and it left her broken inside. Everyone tried to help her, but the wounds cut too deep. 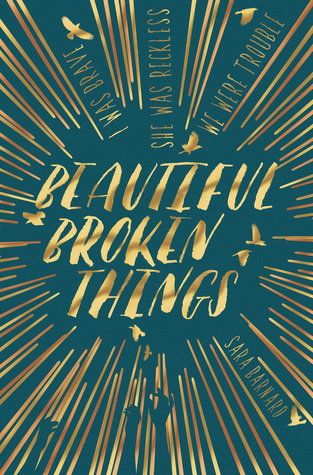 There are so many things that are broken in this book - broken friendships, broken trust and broken spirit just to name a few. Caddy, Suzanne and Rosie, go through some extremely rocky situations but these events make them stronger in themselves and their relationship with each other. If I didn't know better, I'd say that this book was actually written by a teenager, because the author captured what it's like to be a teenager perfectly. This is one of those books you would like to see handed out in secondary schools. It's like a manual on how to be a good friend. I really feel that girls would benefit and be able to relate to the characters within the story.